"By all which is mostly evident, that children do most naturally delight in things, and are most capable of learning them, having quick sense to receive them and unpreoccupied memories to retain them. As for other things where unto they are now-a-days set, they are altogether unfit, for want of judgment which is but weak in them, and also for want of will, which is sufficiently seen both by what we have said before, by the difficulty in keeping them at school and the punishment they will endure rather than be altogether debarred from the pleasure which they take in things." 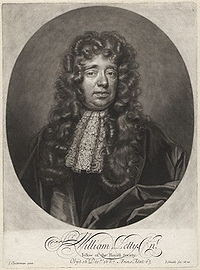 More than any of his predecessors, Sir William Petty proposed to connect handwork with the school, though he never put his plan into practice. 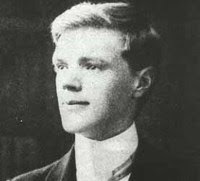 In his suggested literary workhouse he even went so far as to suggest that industrial occupation be an integral part of the school work. He does not seem to recognize the full pedagogical significance of his proposition, yet he did grasp the idea that in learning, the object studied--the thing--should precede the symbol of the thing--the written or printed word. He saw, too, that it gave children great pleasure to make and manipulate things with their hands and with tools. He would utilize this natural impulse in the schools. He recognized the great value of drawing as a means of expression--as a language, and in some cases considered it superior to written language. Therefore he would give drawing, also, a place in the schools. It is noticeable that Petty's chief aim in placing things and handwork in the school was to further general education and not to produce artisans. And so one must wonder when we will have schools that take advantage of children's most natural inclinations rather than fighting for their attentions? It looks like here in the US, we are running about 350 years late. In Finland, where children start reading at age 8 instead of 5, they far surpass us by age 15, reading better in shorter time because their children are made ready for reading through object based learning. Here we continue to apply additional pressure for reading in Kindergarten in our ill conceived plan to catch up, as though extending the amount of time in study will override the child's natural lack developmental readiness. Are we truly a nation of idiots? The natural consequence of our current course is to teach young men and some girls that they don't like school, and aren't good at it. Their heart's desire becomes that of escaping it. In case you have wondered at our nation's epidemic of underachievement by boys, and 30 percent dropout rate and are looking for cause, this single point nails it. The hands have the capacity to draw each of us into heart-felt learning relationships. Doubt it? Give it a try and report back. In schools, we have become so focused on measuring that right and wrong answers rule the day. Black, white, no shades of gray and no polka dots or other forms of creative expression. Subtlety and nuance are out. A populace able to discern the value of diversity of opinion is nearly gone. In politics, right and left are at each others throats, and extreme partisanship threatens gridlock. There are nuts loose with guns threatening violence. Many observers are concerned that we are facing the end of effective governance, but I think that actually took place back when the US Congress failed to prevent George W. Bush's ill-conceived war in Iraq. But what are the values we teach when we focus on right and wrong answers and directing our teaching efforts toward success in standardized testing? Do we tell our students that the subject material is of less importance than their success in memorization? That the grade is more important than the mastery of the material? ...That education is a pointless and unfulfilling game? If any single child feels compelled to cheat to get better grades or test scores, then we have failed to convey to that child a clear sense of the purpose of education. And if we have no clear sense of the purpose of education to convey, then we have also wasted the opportunities that young lives present for the construction of a just and humane democratic culture. With that being too often the case, is it any surprise that we have a 30 percent dropout rate in American high schools? There are better ways to measure educational success. For instance, when you make something from wood, you learn that there are many correct answers, but there is one "correct," purposeful and meaningful attitude, that of caring about the materials, the tools, and the quality of one's effort. 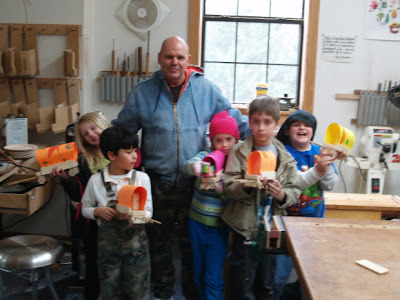 I have this strong suspicion that if we were to have woodworking education for all students, as was proposed by educational Sloyd we would have a populace much more capable of dealing in sophistication, subtlety, nuance, more tolerant of diversity of person and opinion, and far more capable of economic and cultural success. Unfortunately, there don't seem to be many who have noticed. I have talked about this before in the blog, but it came up today in a visit with a friend. Those things which can be most easily measured become of disproportionate importance, overshadowing things that anyone in his right mind would consider essential. For example while schools should be imparting character traits that would insure our children's success, the current educational model is focused on measuring right and wrong answers, thus creating a false sense of reality. Children will cheat to avoid work and learning and thus seek "success," while acting completely contrary to the values we might hope they would learn from the school experience, those of placing value on the process of learning as its own reward. My friend is an engineer whose work, if poorly done would have adverse economic impact in the billions of dollars and affect the life and health of hundreds of thousands of people. His supervisor has a particular interest that when his engineers are scheduled for training that they not show up even a moment late. If someone shows up late by a minute, they must meet with him for disciplinary discussion. Little else seems to be of concern. Rest assured that when someone has a disproportionate concern with the trivial, it covers for a lack of sense of confidence and control over the more important issues. The same is true in our schools. We see that children are disruptive and poorly engaged. It stares us in the face. But if we can find a false sense of confidence by comparing test scores, one school, one class or one student to another, we can create for ourselves a sufficient delusion of our success... even as disruption and disengagement stare us blankly in the face. Wanna do something about our schools? Pull your hands out of your pockets and let's get to work. Also, continuing this morning's subject, metaphor, this link describes Conceptual metaphor: ...the idea that we use metaphors to explore and explain seemingly unrelated scientific principles and concepts. An example is the use of the computer to describe and understand the workings of the brain. They are completely different, unrelated things, and yet the computer analogy can shed light on the workings of a complicated and abstract neurological system. New poll. What is your favorite hands-on metaphor? According to George Lakoff, metaphor is a means through which to gain insight into the ways we think... how we process information and what our deepest, inner-most values are. You want to know something about man, look at his use of metaphor. Our metaphors describe better who we are than any other means of analysis. I have explored the idea of metaphor before in the blog. But look at your own use of language. Choose a favorite in the poll at right, or come up with another favorite on your own to share with blog readers. Other languages are fine as long as you can provide translation. Today I've been living a modern life. I took the number 2 Subaru in for warranty repair, took my daughter for a dental exam and ran around looking at hiking boots... a promised Christmas present for Lucy. It is amazing how our hands lead us through our days, getting dressed, eating breakfast, scraping the windshield, turning the key, steering the car through over 100 miles of to and fro on winding Arkansas hilly highway, and in and out of traffic. The hands operate in seamless interface with the workings of the mind, and if you are a regular reader of this blog, you may have been called at odd moments to take a bit greater interest as a detached observer of what takes place within arms length. The hands literally touch everything. It is equally fascinating to take the same detached observational perspective in relation to the mind. Do you ever simply watch the thoughts that arise in your consciousness? Do you ever observe how they arise and where they go when you are done with them? That process of observing mind is called meditation. If you have spent time observing of the workings of your own mind, you will have seen that we are only fully present to what is happening before our eyes, ears, senses for a fraction of time before the activities within our own thoughts pull us away into what has been called "internal dialog." Even those of us who are quiet on the outside are often chattering away inside the mind. That internal dialog is present within each classroom, within each student in every class... discussion taking place within the mind of each child. If I were to estimate the amount of time "present" and attentive that each child is actually listening to what is presented by the teacher, I would guess 10 percent or less. Lectures are notorious for "spillage" of attention. Even the smartest children are pulled away into their own wandering minds as they formulate questions in response to what the teacher has presented. They have done testing of children's capacities to apply undivided attention and found that it has been lessening each year. So when you think about what happens in many classrooms throughout the US, even at the University level, think of the restroom floor at Schiphol airport, Amsterdam. Spillage. Can we reduce "spillage" by 80 percent? Let's put the hands back in play in American classrooms and see if we can actually do better. Even a twenty percent increase in available attention would be a miracle by today's standards. It helps to have a target, an objective for learning or for anything else we do. In schools children are expected to learn things for which they have little apparent use. But when we know why we want to learn something, and have a clear use for that which we are challenged to learn, we learn more readily, and have greater enthusiasm for it. No question, it just helps to have an objective, a target so to speak, something to aim at. You can test this for yourself, so don't take my word for it. 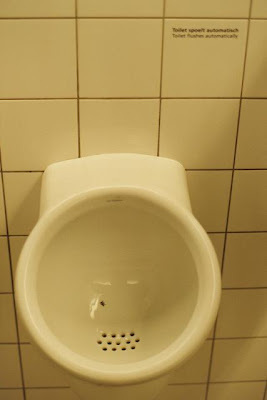 Any male who has flown through Amsterdam's Schiphol Airport (AMS) during the last few years will have noticed something distinctive in the men's room. I saw these coming and going on my flights last year to Helsinki. Each urinal is etched with a small black fly which provides a target for men to aim at, thereby reducing spillage by over 80 percent. This simple idea was proposed by a maintenance supervisor at Schiphol Airport years ago, and is quietly taking hold throughout the world in urinal design. It takes advantage of a natural human inclination... that we take more careful aim and fire with greater accuracy when targets are clearly understood and in clear sight. At some point in American education, I hope we learn to take advantage of our natural human inclinations instead of fighting them all the time. Imagine what would happen in American schools if we were to reduce spillage of attention by 80 percent? What if instead of minds wandering aimlessly, they were brought directly on target, applied directly on task? It can be a simple thing. We can accomplish it by making hands-on activities central to every school experience. Can an 80 reduction of spillage be accomplished? Is this a reasonable goal? Among students being tested in research on the use of gesture in answering algebraic formulas, those using gesture to assist verbal response were 4 times more likely to hit the target and get the right answer. That could be described as an 80 percent reduction in spillage. In the case of restrooms at Schiphol, a target marks the difference between the gentleman and the slob. In the classroom, the use of the hands can mark the difference between idiocy and genius. Do the math. Then decide for yourself and maybe one day we'll get around to doing the smart thing by restoring hands-on learning as central to American education. My wife Jean, my daughter Lucy and I live on 11 acres at the edge of Eureka Springs with our land bordering on a much larger area of mixed hardwood and pine forest. It is our greatest pleasure when this season of cold weather and no bugs arrives, to walk in our woods. For Lucy, the greatest thrill is to go where ”the deer sleep at night.” For a three year old the greatest adventures are found very close to home, in fact, at the top of the hill just above it. Hand-holding is a must do for the journey up, with slippery oak leaves on the steep slope. At the top is an area of tall slender pines with the ground deep in needles. There we find circular areas where the deer lay down to sleep. It has the feel of sacred ground and I have a sense of intruding. From it paths lead in several directions, with the deer’s footsteps remembered as small tears in the thick blanket of needles, the path itself discernible not as much by markings but by a quality best described as the light of a sliver of moon on water. We sit where they sleep. A small flat stone is for Lucy their pillow. We listen for their return. It is truly a marvel that such places exist such few steps from one’s normal consciousness. Once people journeyed from their forests and fields to wonder at the majesty of great cathedrals. Now perhaps it is time to leave our homes and shopping malls to discover the majesty of wilderness. Please watch carefully for slippery oak leaves on steep slopes. Then come with us to where the deer sleep at night. In the fall of 1992 when my daughter was 3 years old she started her first day at Clear Spring School. I was to take her to the preschool, spend some time with her, and then at some point, walk back to my truck and leave her in the company of teachers David and Lorraine, and the children aged 3-5. Parents all over the world face the same moment at some time with their kids. Some are reluctant to let go of mom or dad's hand and engage with other children in the new and somewhat strange surroundings. Lucy was clinging tight to my hand as we explored the building and the playground. As I would start to let go, Lucy's grip would tighten. David and Lorraine were busy with other children. I was beginning to feel uncomfortable, needing to let go, walk away and go on with my own day. A young girl, Jasmine came up us to us. Jasmine is just a few months older than Lucy. "Jasmine, will you hold Lucy's hand?" I asked. Jasmine gently took Lucy's hand from mine, and led her off to play as I stood watching. Lucy didn't even look back. I was a bit choked up on the emotions of it all, and a bit relieved that I could go on with my day and that Lucy would be happy at Clear Spring School. She had a friend. By passing from hand to taken hand a transition had taken place and a point of growth had arrived. And so it is with learning, transformation, regeneration of culture, society, education. The hands are inseparable from the human psyche, the human soul. We forget about them. We may be foolish enough to disparage them, their skill, their efforts in our quest to escape our own humanity. We may cherish the machines that displace their touch, and denigrate hands-on efforts as inefficient. But we are touched by them. The things they make touch us in ways that we cannot explain. You might enjoy reading about the work of Lynn Balzer-Martin on Sensory Integration Disorder It is a syndrome that describes what happens when children are allowed to get out of touch. As parents get more deeply immersed in computers, the internet and gaming, allowing their children to enter virtual worlds unattended, I suspect we will see more. Some parents and teachers are helping to overcome sensory integration problems through hand-in-hand therapy, touch and (real) digital manipulation. And so, we can each in turn, take the great role of Jasmine in things. Take someone by the hand. The wisdom of the hands is much greater than what I can express in this simple blog to my few readers. Now, go off to play and don't look back for a time until you need a reminder. I'll still be here tomorrow. Hands-on learning will be made central to education. It is inevitable. If you need a model of how it can be done, check out the Clear Spring School. I usually have a lot to say, but here, on Christmas morning, with two inches of snow and our first white Christmas since 2002, we will be busy with our hands. We will open presents, make our holiday traditional breakfast of cinnamon rolls, spend a great deal longer than usual in pajamas... I wish all my readers great good cheer. Years ago I met a man who had no arms or legs. He was born with severe birth defects, but had managed to build a successful career as a lawyer. He told the story of being in an airport, standing at the urinal on artificial legs. He had used his hooks to unzip, but in the effort the straps of one hook came loose at the elbow and it fell to the floor. Having no way to either pick up his wayward hook, nor zip his pants, he turned to the man standing at the urinal next to him and asked, "can you lend me a hand?" And so it is for all of us. We need the skilled and sustaining hands of each other. We hold them to make ourselves strong. Our society and our civilization are dependent on our hands, and when we become more conscious of the role they play in our lives, we have greater intellectual resources and capacity. Knowing my friend and what he faces each day gives me greater courage. I will "handle" and open each package with great care and attention, knowing that to do so is a reflection of blessings beyond measure. May this season of holidays and celebrations bring us all greater hope, courage, compassion, and love. Things seem to skip along in generations, and I had the pleasure last night of spending a few minutes in conversation with a former student who now lives in Portland and is studying art. It was very nice to be in the company of one whose artistic talents I had helped to encourage. Hillary expresses such eloquence and enthusiasm for things like texture and the subtleties of letter press. She tells of the friend she taught to turn on the lathe, and her life among other lovers of art and fine craft. 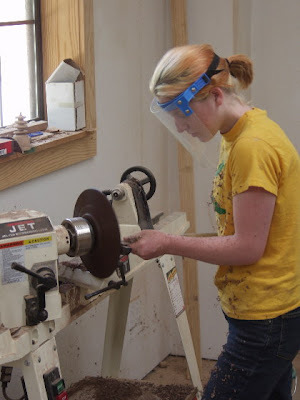 The photo above is from Hillary's senior year in the Clear Spring School woodshop. And so we know that the wisdom of the hands is alive and always will be. The hands are hardwired at the center of the human experience. The question is a matter of: "When will we will take best advantage of who we are?" Do we use our full human resources to engage children in learning and making and for their discovery of their human capacities or do we use schools to suppress our natural human inclinations to touch and to make? Early educators, like Comenius, Rousseau, Pestalozzi, Froebel, Salomon, Dewey and so many others realized that hands-on creativity was necessary as central to the school experience. 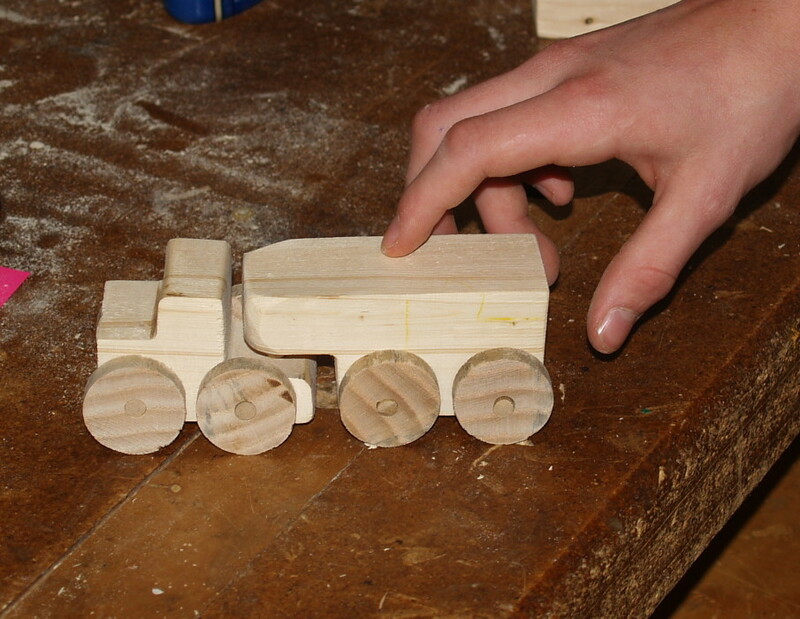 They proposed the strategic implementation of children's hands in learning and making. But it seems that vital bit of information skipped a couple generations. You and I can help to remind. I want to congratulate John Grossbohlin for completing his annual Christmas gift project in time for the finish to dry. His beautiful trays were inspired by one he made in Junior high school when woodworking was thought to be vital to every young man's education. When you understand the strategic value of the hands, you understand the tactical value of the arts. Music, dance, and the arts are among the means through which to purposefully engage the hands in learning and the continuous re-creation of human culture. We all know that the hands literally touch every facet of human culture. We have left our mark on the planet in what we have made, and through the tools we have crafted, and if we were to come to terms with the central role that the hands play in our lives by placing them at the center of our interest in education, interesting things would unfold. Finger use for math calculation is natural and intuitive. Fingers are readily available and well suited to our base-10 number system. However, many teachers and parents question the value and appropriateness of ﬁnger use in elementary school, even though most contemporary math curricula encourage concrete representation and manipulation of quantities. ...Our ﬁndings suggest that in kindergarten children should be encouraged, or even explicitly taught, to use their ﬁngers. And so, if we want to re-energize American education we need to develop specific strategies to systematically re-engage our children's hands in learning. An effective part of that strategy is Wood shop! 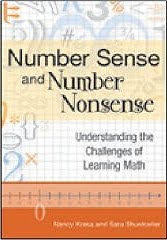 I have been reading a book by Nancy Krasa and Sara Shunkwiler, Number Sense and Number Nonsense, Understanding the Challenges of Learning Math which explores the difficulties and impairments that some children face in learning math. One thing it points out is the importance of counting on fingers. Children who start out using their fingers to reckon sums and differences in kindergarten tend to be more accurate... and consistent accuracy leads to quicker mastery. Thus, among children who use their fingers early on, finger use declines by second grade as they master the facts. By contrast, children who do not use their fingers in Kindergarten -- a characteristic of many children from low-income homes -- tend to rely on their fingers increasingly as they move through the primary grades and often fail to catch up to their more privileged peers in calculation accuracy. For reasons that are not yet clear, boys' finger use typically declines, and their accuracy improves more rapidly than do girls'. ...the quantity-sensitive areas of the brain are embedded in a broad region that also allocates attention, tracks objects through time and space, and maintains hand and finger awareness and control -- all skills that young children use when they point to and count objects. 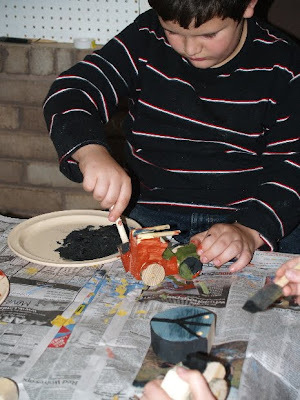 As nearly all early educators noted we enter the realm of abstract thinking directly through use of our hands. To leave them sidelined when there is so much learning to do is a tragic mistake. These are carved green from the cherry plum tree wood that we pruned last Saturday. Presents for the cooks among us. Hand tools made by hand for hands to use and enjoy. And no doubt making them is more pleasurable than fighting crowds at the mall. When you make a tool for others to use, you extend an invitation that they, too, become engaged creatively through their hands. Today in my shop, I'll be milling walnut and maple for a table, also cleaning and cooking in preparation for my daughter arriving home from college for the Christmas holiday. Comenius is widely considered the "father" of modern pedagogy, and how soon we forget. This morning I delivered the toys we had made at Clear Spring School to our local food bank. There was already a line at the door, so I hope the economy improves soon and puts people back to work. The toys provided by the students may help to alleviate some of the strain, giving children something to do while their parents shop for food. On the subject of work, Comenius said, "We give form to ourselves and to our materials at the same time." The worst part of unemployment can be the loss of sense of self... the effects on the psyche. 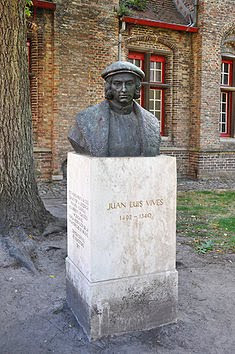 Jun Luis Vives is considered the first scholar to analyze the psyche directly and for that is viewed by some as the "godfather of Psychoanalysis," ahead of Freud by 400 years. Friedrich Froebel's first emphasis was on preparing young mothers in their roles of providing the foundation of their children's education. When he said "let us live with our children," he was not suggesting that we honor their every whim, but that we bring them into our lives, and that we take time to enter theirs through play. There are special things that a mother does with her children, and there are special things that a father can do as well. A friend of mine, Frederick Peace tells the story of letting his five year old change the oil in his car. A friend of his was shocked. "How can you let a 5 year old kid do that?" "Why not?" Frederick answered, "he's watched me do it often enough." And there you have an important lesson on education in a nutshell. One of the attendees of my webinar asked a question about homeschooling that I know I failed to answer adequately. Home is truly the first school and by all reckoning the most important one, regardless of whether a child ever goes to a private or public school at a later time. In the home, the child develops his or her attitudes about learning, and answers important questions about self: "Am I important?" "Am I valued?" "Am I responsible?" "Am I one who contributes to the well-being of others?" "Am I smart?" "Can I be trusted?" These are questions a child has most likely answered for himself long before the first day of school, by being given responsibilities in and around the home. And so what happens within a child when he or she is trusted and expected to participate in things important to daily life? Cook, clean, plant, harvest, make, fix, build, sew, make music, make noise, get messy, play, have fun. If the use of the hands makes us smart, home is where it begins. Regardless of what happens in schools, what happens in homes through the guiding hands of parents and grandparents is of the greatest importance. Fathers and grandfathers in particular have an important role to play in all this. Arne Duncan, President Obama's Secretary of Education proclaimed a program back in July called "Race for the Top" through which they would create teacher and school incentive s for classroom achievement. But can education be likened to a race? It might seem an exciting metaphor. We can stand on the side lines and cheer our children on. But how do we give them strength and endurance for the long haul? We are faced with national challenges with profound implications. How do we best prepare our children for what they will face in a world of increasing competition for scarce economic resources? The hare and tortoise! If we are looking at education as a race, is it speed that should concern us? Or depth and lasting effect? If Finland starts reading at age 8 and far surpasses us at age 14, while we apply increasing pressure toward reading in kindergarten, are we seeing enough of the full picture? Is there something we might learn from a larger view? In the woodshop, I frequently tell my students, Slow down. Be patient. Don't rush. Give it your best. But is that what we are doing when we "race to the top?" The Machine Stops written by E.M. Forster, 1909 is interesting reading for anyone using the internet. I am taking a day away from the wood shop and the making of sawdust to recover from a cold. In the meantime, my shop tip on the use of sawdust was published in the current issue of Fine Woodworking, January/February 2010, page 18. The tip involves using sawdust to wash your hands prior to soap and water. It is a great technique for removing greasy, oily substances from your hands prior to soap and water. I scrub my hands with sawdust to remove Danish oil after applying it to my boxes. If we keep going as we have been going, moving more deeply into a world of virtual entertainment, rather than real meaningful service to others, we might just as well pack up and head for Silver Dollar City. There amidst the holiday Christmas lighting, you will find stuff for sale made by "old time craftsmen" going through the motions of making stuff. Of particular note to woodworkers you will find the furniture shop which claims to have equipment from the original W.O. 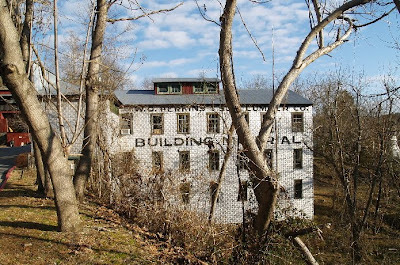 Perkins Mill in Eureka Springs. Thankfully, this is not really the case. They had tried to buy it all years ago... the tools and equipment that built many of the fine Victorian homes that continue to grace our lovely town. But not having actually acquired the equipment, they lie about it. They got their system of belts and pulleys from another location that cared less about history and authenticity. There have been cases in the news lately of "stolen valor" in which attention hungry individuals parade in medals they did not win and in uniforms of national service they did not serve. You can be arrested for that. In the case of stolen authenticity, as long as it serves the cause of making money, I guess it's OK.
As we live more and more in the shadow world of moving electrons, finding ourselves in idle entertainment, perhaps a lie is no real significance. And why should the matter of authenticity stand in the way of marketing if there is money to be made? What kind of authenticity will children raised in a computer game culture know? Perhaps we should follow our parental inclinations to over protect and prevent them from coming in contact with real reality. Some parents are already there, ready to implant artificial authenticity into the lives of their children. At Silver Dollar City, they have beautiful water falls emerging from the tops of fake mountains, and the tourists line up to have their photos taken amidst the backdrop of pure and everlasting sculpted fake beauty. I am reminded of the grown-up who arrived at Kings River Outfitters and asked guide/owner Ernie, "I want to take my family for a float, but let me get this straight..." pointing downstream he said, "We get in the canoes and go there," and then pointing upstream, he asked, "and we come out there?" He thought he was in Silver Dollar City amusement park land where artificial rivers bring you right back where you started. "No, this is a real river," Ernie patiently explained. "If you put in there and you never stop, you will go down the Mississippi to the Gulf of Mexico, but it will take months." But does all this matter? This is the life we are creating for our kids. But in the basement of W.O. Perkins Mill you will find real authenticity if you peek through a dusty window at the back. The very old diesel heart of the matter. To start it up, you had to build a fire in the cylinder to get it warm. 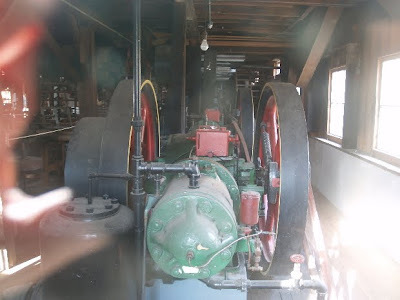 The engine would fire only when needed to maintain the selected RPM. When the load was light, the explosions in the motor would happen at a slow cadence. Whoomp..... Whoomp..... Whoomp.... When the equipment at work pulled power from the line of belts and pulleys, the explosions would gain in frequency. Whoomp... whoomp, whoomp, whoomp... whoomp. The wonderful machine could be heard all over town as W.O. Perkins milled and shaped the materials to build this small city. You might agree with me that authenticity is worth whatever effort is required that it may be preserved. Or perhaps not. 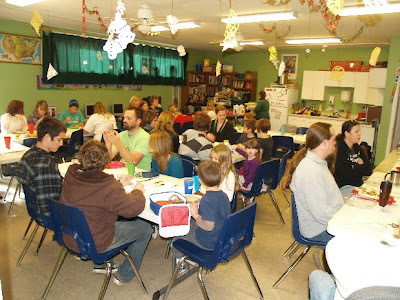 Today we had what we hope will become another Clear Spring School holiday tradition, a holiday feast, this one, today, our first. 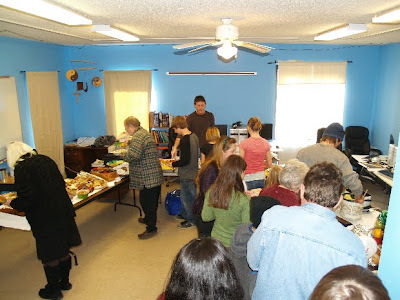 Students, teachers and parents worked together to prepare a meal. Students decorated the tables and prepared name tags at every place setting. They made the room decorations and each classroom prepared something for the feast. For example, the first second and third grade students supplied the bread and cornbread. It was great fun to gather and share in the spirit of the school. Students told me, "I just can't wait until the Monday we get back." "Why?" I asked. "Woodshop!" they proclaimed in unison. Jade told me, "I just love the way it smells." And so, our holiday break begins. I'll be doing other things in my own woodshop for the next two weeks. But the time away will pass quickly. A new school, "Quest to Learn" in New York City is using video games as the central element in children's educations. As described by an article in Popular Science magazine, Foundations and Universities have poured money into the concept. "Games are exceptionally good at engaging kids," says Quest's main designer Katie Salen, a game designer and technology professor at New School university. "They drop kids into complex problems where they fail and fail, but they try again and again." Some might wonder, "engaging kids" in what? And to what purpose? According to the article in Popular Science, the school's model draws on "30 years of research that shows that people learn best when they're in a social context that puts new knowledge to use." I can't disagree with that premise. I am assisted in my learning about education by having the opportunity to share what I learn with you. And no one can question the effectiveness of modern technology at engaging children and adults in self-directed learning. After all, I use technology daily to write, edit text, photos and video, and to keep track of business and finances. I never took a class in any of these things. You keep trying and failing and after awhile you learn to avoid making the same old mistakes over and over again. "That is all very well. I like your industries and your factories and your wealth; but, tell me, do they turn out men down your way? " That is the question which we are bound to consider. Is this civilization of ours turning out men—manly men and womanly women? And so as we dive headfirst into the implementation of gaming technologies, there are still a few questions we might want to consider. Are we teaching our children to accept real responsibilities within human culture? what's a car without a bit of color? This year the students wanted to paint a few of their cars, and I would prefer in most cases that they be left plain rather than be done sloppy. But for some kids, the pleasure of applying the paint is of greater importance than how the project looks when completed. The photo below shows a few cars done by the 7th, 8th, 9th and 10th grade students, and showing a bit more maturity and naturally higher standards and skill in the application of paint. But fun was had by all. How do we put the hands back in schools? I guess we have to go after it "hammer and tongs," meaning "with great energy and force." The phrase comes from blacksmithing. As we now have little opportunity to see men at work except on TV, we can expect our language and metaphors to become less colorful, and few children will know what the heck Zippy is talking about. Today the 1st, 2nd and 3rd grade students at Clear Spring will continue making toy cars for distribution through our local food bank. 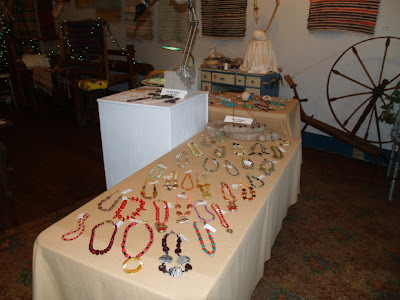 There have been long years of discussion in Eureka Springs as to the relationship between arts and crafts and the differences between the two. Some differentiate between "fine arts" and crafts and "fine crafts" and art, and it becomes a challenge to sort out who's talking about what. And so where does Educational Sloyd fit in? Is it one or the other? Art or craft? I propose neither. Its purpose is not the promotion of arts OR crafts, its product is not the objects produced. Its purpose and method are the promotion of skill, intelligence, mental capacity, and democratic values within schools and within society at large. So instead of being either, it is a specific developmental or formative method of both and of all. If a school has Sloyd, does it still need art? If it has art, does it still need Sloyd? You are welcome to chime it. Comment. Discuss. My own feeling is that Sloyd, offers some things that you won't find in arts classes. There is an intended rigor to it in the progression of models, from easy to difficult, and simple to complex. It demands the building of skill, offering a model for that process that can be applied to any human exercise requiring growth of skill and intelligence. For when children shape wood, in essence, they give shape to themselves. 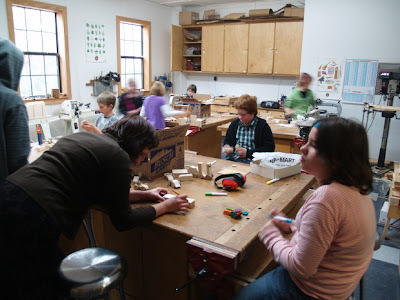 We have one more day of Clear Spring School toymaking for our annual toy project. It can be very hard for children to give away the things they have made. My goofy 7th, 8th and 9th graders took the lead on this project, and you can see the toys completed so far. More to come tomorrow. I started taking video of the process for making the cars, so may have a youtube video to share sometime over the holiday season. You can review the recorded webinar by downloading here Purposeful Engagement of Children's Hands for More Effective Learning. You will need windows media player whether you are on windows or mac. Unfortunately parts of the audio are slightly garbled, and the early part of my PowerPoint failed to forward to new slides until it was brought to my attention and we tried a slightly different process. Host Marsh Myles, assures me that my attendees were present for the content and that the technical glitches did little to diminish the value of the presentation. For me, it felt awkward, but download the webinar and find out for yourself. Today the 7th, 8th and 9th grade students will be working on their toy cars, painting some, and I'll try to take some video of the process. The hands have the unique capacity to draw each of us into heart-felt learning opportunities and relationships. Tonight at the Clear Spring School, we had three guest artists who had spent the last two days helping the students in the design of art. Adrian Frost, John Stallings and Dave Brooks produced, with student help, a bamboo sculptural structure at the Clear Spring High School building, and the unveiling to parents and our annual hand bells performance shared the evening. 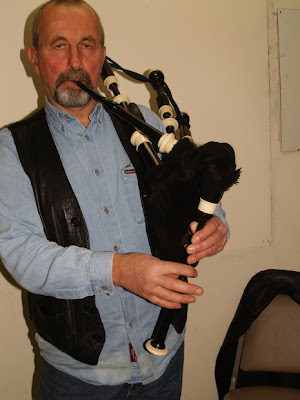 Dave Frost is not only a visual and tactile artist, but also a bag-pipe artist as well. So the night's music included a rousing performance, and Dave was kind enough to allow me to capture his hands in action. 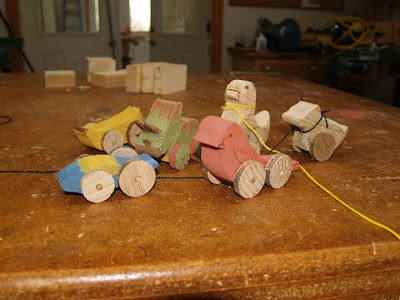 In the woodshop today, the 4th, 5th, 6th, 10th, 11th, and 12th grade students worked on toy cars and trucks for holiday distribution. My webinar did not go as well as I would have liked today. There were some technical problems on the site, and then I had far too much information prepared for the amount of time available. The problem is that the hands touch everything, and to give a clear picture of how and why to engage them in schools is a very large subject that I should have whittled down into a smaller bite. One thing is strange about the webinar format. When I speak in public, I have the opportunity to gauge audience response. I can see how people respond to what I share with them. The webinar leaves one wondering whether connections have been made, and how what one has offered has been received. I look forward to feedback if any of my regular readers were in attendance and have any comments or criticisms to offer. One other thing is that educators are looking for answers and what I have at best, is a set of questions. How can we better engage children's hands in learning? We have a strategy at Clear Spring School, and have a rationale for it that may or may not seem relevant to others. But I feel that here in the blog, you, my readers and I, have a shared understanding that we learn best and most effectively and with the greatest retention when we learn through hands-on creative processes. 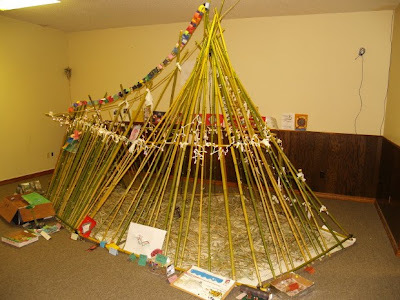 How to redesign our schools to make best use of the natural inclinations of children to learn, play and create is a question I raise that I hope receives further thought. This morning I will present my first webinar and I awakened early thinking about a few last minute rearrangements. I hope some of my regular readers will attend and participate. It will be archived so it can be downloaded and viewed at a later date. You will find your invitation in yesterday's post. What I offer to education is a rather simple-complex thing. The hands have given shape to every facet of human culture and thus are the key not only to understanding education but for understanding ourselves. If, as was made known to me, I can help others to understand the essential role the hands play in our learning, then the reason for change in educational methodology becomes a no-brainer. It won't necessarily make needed change easy, but the hands will point us in the right direction. So please join me for a lively presentation and opportunity for discourse. You can register for live participation in my 10AM Eastern Dec 14, 2009 webinar https://www1.gotomeeting.com/register/759632561 anytime between now and the prompt 1500 GMT opening of the event. Give yourself a few extra minutes to log on. If you want to use your computer for sound, you should have a headset to avoid feedback from the built in computer microphone. There will be two moderators to relay your questions and coordinate the event. The webinar presentation is entitled: "Purposeful Engagement of Children's Hands for More Effective Learning." I am busy with lots of things today as I organize files and prepare for what I hope will be a coherent and informative event. It will also be archived for later download and viewing. Toys are a trapeze, swinging us from age to age. Those that leave nothing to the imagination never sweep us off our feet. So maybe it's good news that toys have turned out not to be recession-proof after all: analysts called last year's holiday sales the worst fourth quarter in decades — and it was the flashy, buzzy gizmos that fell fastest, while the classics held their own. Kids like the dough more than the cookies, the box just as much as what's inside. This is a rare case when the straps around your wallet serve the interests of your children, who might amaze you with what they can produce with a pile of construction paper, a box of crayons, some glue and a quiet afternoon in which to use them. In the meantime, a milestone quietly passed yesterday. The blog now has over 2000 posts since it was started in September 2006. I have been ruminating on the history of the hands, and how they have, single handed, shaped our humanity. They literally shaped every aspect of human life, human culture, and now the machines that the hands have produced, extending the range of their power have become a threat, altering the balance of life on the planet. What if we were to become more conscious of our hands, more deliberate in their engagement? Would it make a difference? What if we were more creatively engaged in our own lives, making for ourselves the things we needed, and living more local, hands centered lives with each other? I am no Luddite. I feel competent and confident in my use of technology, but I do believe that being engaged in life through our hands, in direct exploration and creativity would answer a few problems. Viktor Lowenfeld, (1903-1960) was a pioneer in the field of arts education, and described the visual-haptic continuum. Some students, he noted, were primarily visually inclined, while some are more engaged through their sense of touch. In art class the line might fall somewhere between painting and pottery and fortunately some artists have managed to bridge the divide. Jackson Pollack, and Pablo Picasso are examples. Haptic refers to the sense of touch (from Greek ἅπτω = "I fasten onto, I touch"). So you can see that it refers to the sensory engagement in the creative process. Friend and noted University of Arkansas Art Historian and novelist, Donald Harington, (1935-2009) told me that in all his years of teaching art history, he never had a potter get better than a "B" in his course, and Viktor Lowenfeld had noted that art teachers are generally selected from those who have the best foundation in drawing, a primarily visual, rather than haptic expression. The consequence, sadly, is that many students never gain an understanding of their own artistic capabilities. What we hear too often is the artistic lament, "I can't draw." And so it is time to engage all students in the full range of the arts. Last night at my book signing at the Historic Arkansas Museum, a teacher enthusiastically introduced me to her school principal, and I offered my Wisdom of the Hands business card as an advocate of hands-on learning to a chilled response. Perfect counter-point to an evening of eggnog. It was an excellent reminder that as I prepare for my webinar with Michigan educators, that not all human responses are 1. patient, 2. rational, 3. open minded. Often people are swept up, dominated in their own thoughts, under pressures that cause them to respond in ways that limit their perceptions and their openness to new ideas. One only needs to watch American politics to get a sense of how polarized we can become over things like position and power, to the point that we become out of touch with reality. So what does the craftsman's perspective derived from materials and personal growth offer to the probability that as I present to educators, I may also come under attack from educators who see things only in black and white and are unwilling to grasp the essential relationship between learning and the hands? Last night's book signing was a small but gracious event. I and my books were a sideline to a museum sponsored competition for tasting eggnog. The "winners" where those whose eggnog was voted best, but it seemed that nearly all were winners of holiday spirit. Over all, those I talked with readily understood the concept of wisdom of the hands. After all, they were standing in the midst of hand crafted Arkansas products. Most had experience to draw upon... of making, fixing, and being in the wilds. There are things that some may not get yet quite yet, but the hands can be patient teachers. One does have to test what one learns in one's own hands for depth of meaning to come clear. There are trees that are not ready for harvest. There are boards in my own shop that still await their perfect use. And yet they are kept and cherished for their correct time to be cut and shaped to meaningful use. In particular, green lumber must be dried, aged and mature prior to successful use. Life in a small town is special preparation for engaging the larger world of ideas. Here, when a new idea is offered, people often ask, "Whose idea is that?" And some will question my observations for the very simple reason that they aren't derived from the pre-approved sources. I'm not Harvard, and I'm not Yale. But I feel that I can give voice to Salomon, Froebel, Pestalozzi, Comenius, Montessori and others who lived and breathed education before the current round of No Child Left Behind trampling of the American spirit was allowed to infect American education. Today at Clear Spring School the high school kids had their physics class launcher war, in which their projectile launchers were aimed at each other's and the fight was to the finish. It was a fun culmination to the project. I had to leave for Little Rock before the war was finished so I will find out later who won. Easton's very well made launcher was great for long range. Mine shown below, had the advantage of throwing our disk shaped projectiles so they would roll upon landing. It was still in contention when I left with a volunteer using it in my place. 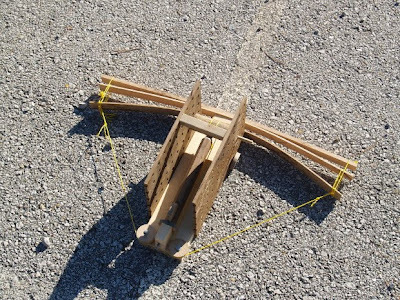 Today in the woodshop, the high school students will finish their projectile launchers and then the battle will begin. Safety glasses will be provided. I will have some photos to share later in the day, or after I arrive in Little Rock for the night. You are probably like me, in that you have occasional problems with technology and would like to get some kind of handle on fixing things yourself. When you have skills at fixing things and they go wrong, instead of wringing your hands in despair, you feel a sense of glee at the opportunity to get out your tools and go to work. iFixit.com is a good place to start and they have launched a Q&A section to their website where participants can help each other to solve fixable problems. I recently ran my cell phone through the washer and got conflicting advice over the web. I don't know for sure, but I now believe that a more patient response may have offered a better solution. My old cell phone is off to recycling. But fixing things is a matter of personal growth, mastery of physical reality, confidence in being a member of society, whether you are successful or not. Who really wants to be dependent on stuff working, when we could instead be working on our stuff? It is a choice of who plays master of the universe, and slave to technology is not all the fun it's cracked up to be. The hands have the capacity to draw each of us into heart-felt learning opportunities and relationships. The time is 10 AM Eastern or 1500 GMT, Monday December 14, 2009. The presentation will be archived for later viewing. You can call in for voice using your standard phone line or use your computer headphones and microphone to participate. 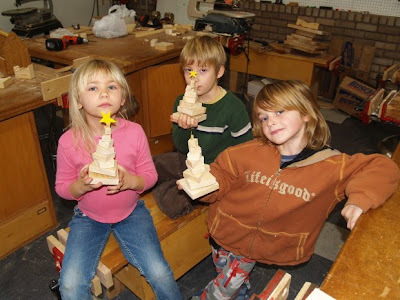 Today the Clear Spring School first grade students made Christmas trees cut from a triangular piece of wood. Each piece is sawn from the triangular stock that tapers from 3 1/2" down to nothing at the other end over a 13 inch length. It is an easy project, and the children will do the painting and final decorating in their classroom. The project starts with two students teaming up to make the angle cut from one end of the 3 1/2" x 13" board to the other. Then each has their own sawing and drilling to do to complete the tree. "Give them a ready made boat: at first they are pleased with it, its novelty gratifies them, but before the lapse of many days the toy is cast aside and forgotten; but if the boat had been constructed by the children, they would have taken a pride and pleasure in it for years. So, here is a list of holiday gift ideas that will serve children of many ages, and serve long after this holiday season has passed... A plane, a saw, a hammer, a knife, a box of wood scraps, a tape measure, an assortment of nails and fasteners, a bottle of glue. Give these gifts before the child's creative powers are dulled and wasted, while the child is still alive to his or her own creative inclinations. Absolutely exact work is not demanded from anyone--child or adult. There is no work so perfect but that some fault can be found with it. Adults cannot do perfect work, and children should not be expected to. They should, however, be expected to do correct work--using the word correct in a relative sense. The amount of exactness to be demanded depends on the nature and capability of the child, and, as these capabilities vary, so will the standards of exactness decided upon vary in accordance with these capabilities. But how shall the teacher determine the standard of accuracy and exactness just suited to each child? The potent factor is a true estimate of the individuality of the child. The educational tact of the teacher aids him in determining this; not only so, but it is the main factor in deciding upon the amount of exactness to be demanded. We cannot lay down rules for this purpose: everything depends on the teacher himself. He must bear in mind that if too much exactness be demanded, children become disheartened, and gradually acquire a dislike for the work. Yet, at the same time, it must be remembered that the more exact a piece of work is, the greater is the pride its creator takes in it, and the greater is the value set upon it. When a teacher has a student take home a piece of furniture and exhibit such pride in its display, he or she can know that a proper balance has been achieved, even if he or she might have noted plenty of room for improvement in the finished work. (1.) To instill a taste for, and a love of, labour in general. (2.) To inspire respect for rough, honest, bodily labour. (3.) To develop independence and self-reliance. (4.) To train habits of order, exactness, cleanliness, and neatness. (5.) To train the eye and sense of form. To give a general dexterity of hand, and to develop touch. (6.) To accustom to attention, industry, perseverance, and patience. (7.) To promote development of the physical powers. (1.) To directly give dexterity in the use of tools. (2.) To execute exact work. Clear Spring School also has two purposes, one obvious, and the other less so, depending on the angle from which you view it. These are very similar to the two purposes of manual arts education. While Clear Spring serves the learning needs of our small group of children and their families, it was originally established as a demonstration model to explore and illustrate progressive educational methods. So while Clear Spring School offers service direct to its children it is also "formative" as a means through which to have effect on the educational community at large... a means through which the best of formative education can be made known to our nation. To have that effect, we are very dependent on the support of our community and it is a constant challenge to to raise money for this effort. You and others can help. We know that personal connection is the foundation of successful fund raising. If you know of a foundation with which you have a personal connection, and if you would like to help, please contact the school. This is also the time of our Clear Spring School annual appeal. Your tax deductible donation can be sent to Clear Spring School, PO Box 511, Eureka Springs, AR 72632. The 4th, 5th and 6th grade students worked on toy cars today, and the high school students worked on their projectile launchers. Easton brought in an incredibly well engineered model that he had worked on at home. You will see it in action on Friday when we battle it out for number one. My own launcher looks great, but is so puny in its effect that it should provide some comic relief. The time is 10 AM Eastern or 1500 GMT, Monday December 14, 2009. The presentation will be archived for later viewing. On another subject, I am extremely pleased to announce that Sloyd will be returning to Boston Schools. This will be the first attempt to begin a Sloyd woodworking program in an American public school in nearly 100 years, and just as North Bennet St. School played its part in bringing Sloyd to America, through the leadership of Miguel Gómez-Ibáñez, NBSS will begin working with the their neighborhood school, Eliot K-8, offering Sloyd to the middle school students. What is it? How can it be packaged? 60 Minutes, a CBS news program broadcast a program last night about Geoffrey Canada's "Harlem Children's Zone" which gives children in poverty a leg up in competition with the children of more privileged parents. The big news in last night's program is that the Children's Zone is working. Test scores tell that the HCZ's children are performing at a par with those given the benefits of better neighborhoods, better educated parents, and greater wealth. Experts are trying to figure out how to package the Harlem Children's Zone model for distribution in other communities. Is there a single thing, a magic elixir that can be transposed to new sites? What you can see through the eyes of the 60 minute report is an area in Harlem where Froebel's maxim, "Let us live for our children," is to brought to life. Can we broaden the application of this maxim, so that it might apply to a whole nation? In relation to Geoffrey Canada's work, you might enjoy this blog post by Deborah Meiers, What works for rich kids works for all kids. And you might also enjoy the interesting addendum by Diane Ravitch, "What does the best and wisest parent want?" Today in the Clear Spring school wood shop, the 4th, 5th and 6th grade students will finish their maps of Pangea, and begin making toys for holiday distribution. 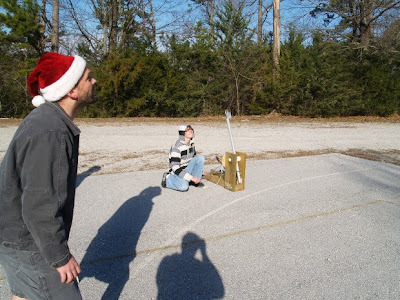 The high school students will finish their launchers for the study of physics. Placing children at the center of our universe involves giving them the creative capacity to explore through their own hands... 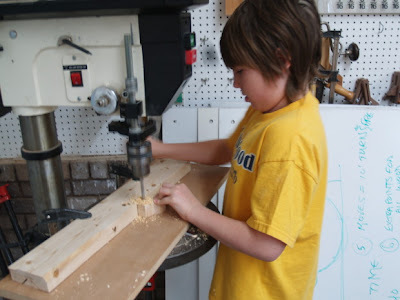 It involves trusting them in the responsible use of tools to shape, create, and make new. And as in the case of our CSS students making toys, we'd best give them the opportunity to give and share what they have created with others, allowing them to find in themselves the model for our future. It is said that two points create a line, but if you know something of the sequence in which the points are established, not only is a line formed, but as a vector, it describes movement and direction. That's why it makes a difference to understand the history of manual arts in America. By examining the starting point of manual arts we can gain insight into its future. Will it begin to play a renewed role in American education? Perhaps when we regain a sense of its beginnings it will point toward its destiny. While Friedrich Adolph Wilhelm Diesterweg was not specifically an advocate for manual training, we was one of the philosophical influences that Cygnaeus drew upon in the formation of the Finnish Folk Schools. He was a prolific writer, with his most notable works being on the role of the Volksshcule (folk school) in the promotion of democracy. As with Friedrich Froebel's Kindergartens, the Kaiser shut his schools down, too. Progressive education and an intelligent populace are inconsistent with the aims of militarism and authoritarianism. Diesterweg has been attributed as author for the command, "Learn to do by doing." My first paid to write article was for Mother Earth News over 25 years ago concerning an interesting use for sawdust, so it is particularly gratifying to see that the world is starting to catch up and the concept of using sawdust in the treatment of human wastes has at least made it to the mainstream media. Humanure in Time Magazine describes the composting of human wastes to not only save water, but to create useful, safe, composted fertilizer for gardening. 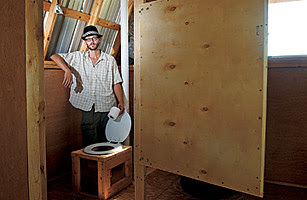 Years ago I made a presentation to the Berryville Arkansas Rotary Club about composting toilets during our self-proclaimed "National Water Week," and during our National Water Week activities here in Eureka Springs I taught a compost toilet building workshop. We were unsuccessful at getting a national audience for our "National Water Center" activities, but it was a matter of timing rather than one related to the importance of the cause. During my talk to the Berryville Rotary, one of the members noted that on-site waterless treatment of human waste was not a strange proposal to a community that had grown up with out houses. Now with clean water becoming an increasingly scarce resource due to mismanaged and inefficient waste treatment and industrial contamination of water, re-examining the concept of using water as a vehicle for the transportation of wastes is essential. 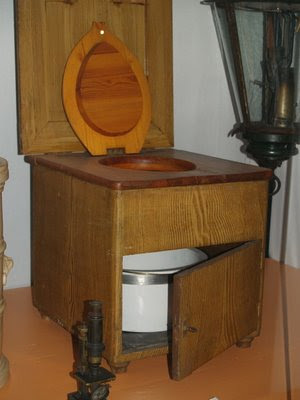 This is not a new idea as you can see from the sawdust toilet from Helsinki shown at left and as used over 100 years ago when some people had the idea that polluting water with human waste was wasteful, irresponsible, unhealthy and destructive. "The Internet is global and seemingly omniscient, while iPods and phones are all microscopic workings encased in plastic blobjects... compare that to a steam engine, where you can watch the pistons move and feel the heat of its boilers. I think we miss that visceral appeal of the machine... Plus, those Victorians dressed a lot better than we do." Perhaps this new subculture will make kids do much more than just dress up funny. What if they became inspired to make things? Steam anyone? What a welcome change that would be... A subculture that aspired toward the hand made, and whose values were based not on outward appearance but on the ability to create. Those who are willing to buy art are essential to those who make it. In the Obama administration, they wonder how to stimulate the economy without growing in greater and greater debt to the Chinese. The answer, of course is for Americans to buy useful and beautiful art and crafts from from each other. What a great gift buying and giving season this might become! And hand-made things are the gift that keep on giving to community and culture. Through the making of things we gain in skill and intellect, making our communities rich with greater wisdom. Giving finely crafted objects to others informs them that we are thoughtful, creative, intelligent, environmentally aware, and sensitive to concerns about local development. And of course that we have great taste. We had a nice time at Lux Weaving Studio this evening, selling beaded works by Eleanor Lux, pottery by Karen Foster, and my own books and boxes. I was on KATV this morning to promote the 2010 Arkansas Living Treasure award for the Arkansas Arts Council and the Dept. of Arkansas Heritage. Now I am home briefly and off to get work priced for this evening's book signing and sale at Lux Weaving Studio. If you are a local reader, please stop by. 18 White Street, Eureka Springs. 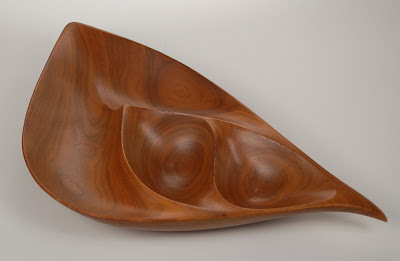 There is a great article about American craftsman Emil Milan and his work in the annual issue of Woodwork magazine. I had been previously unaware of his work. Do a google search and you will find more images of his exceptional design and craftsmanship and even find some work available on eBay. The object shown is available for purchase through Bond&Bowery. "Things men have made with wakened hands, and put soft life into are awake through years with transferred touch, and go on glowing for long years. While we are so overly concerned with testing children, this should be the test for teachers and administrators in their qualifications. Do they know what it means and have they done something in their own lives to express and affirm it? I would prefer it be an essay test or a hand-made object expression of the concept rather than multiple choice which reveals nothing. 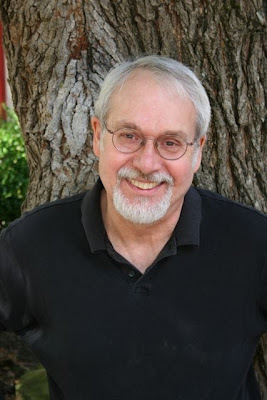 You may recognize "with wakened hands" as the title of James Krenov's last book. I have 3 Physics students in my year 12 Furniture class. Yesterday we practiced hand cut dovetails in preparation for their drawer making project. 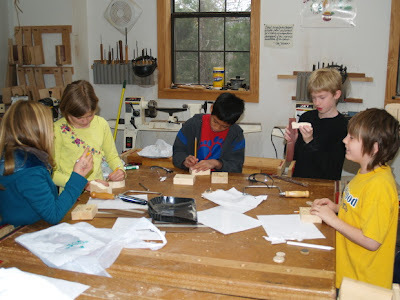 I asked them at the end of the session which is more difficult, Physics or making dovetails? It may not be the right question yet but I am interested in their answers when they compare the types of thinking involved in other subjects with what they do in a furniture class. It is a great opportunity to have some students who have some success in the ”academic” disciplines and who also succeed in a practical area to discuss this matter with. What I should ask is what are the similarities between solving a problem in Physics and joining two pieces of wood. It is understanding the connections that is important. I had a building student ask me the other day “What is Geometry?” How could I explain to him as I picked myself of the floor that the whole world of the work that he is entering is based on Geometry? 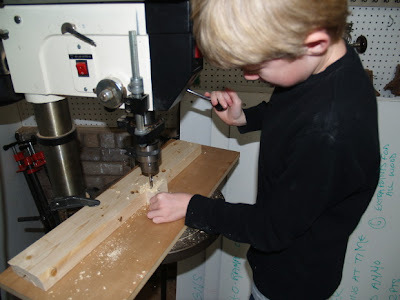 Teaching woodwork gives us the opportunity to teach about the connections. "Tool work without the theory of construction is educative to some extent, especially in the first stages of its practice. Tool work taught with the theory of machinery, with applied mathematics, is far more educative than mere tool work; and its educative influence lasts for a much longer time. Tool work with its theory and with natural science is permanently educative, and it does much to raise manual labor above drudgery; and especially is this the case if it is studied with the history of ornamentation and with careful cultivation of aesthetic taste. But when compared with the present course of study in the schools it cannot be claimed that manual training opens any new window of the soul, although it may give a more distinct view from the window that opens toward inorganic nature." Dr. Harris, while being critical of the manual training he saw practiced in schools was a major advocate of Kindergarten. 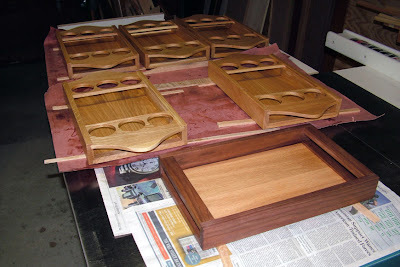 I have a long list of things to do, most of which take me away from the woodshop. On Saturday morning I will be on TV in Little Rock to promote "Arkansas Living Treasures" for the Arkansas Arts Council and Department of Humanities. So I have 8 hours of driving for 4 minutes of fame. If you are in the Little Rock area, the station is KATV-7 and the program is Saturday Daybreak and I'll be on sometime around 8AM. Then later in the day, I have a book signing at Lux Weaving Studio on Saturday Dec. 5th, 5 to 8 continuing Sunday Dec. 6th 12 to 5. 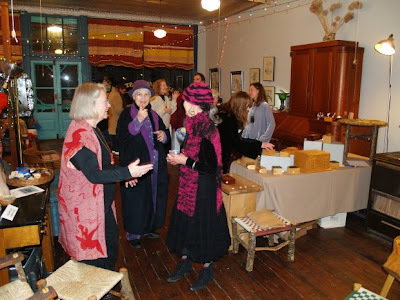 Eureka Springs artists Eleanor Lux, Mary Tait and Karen Foster will be there to sell their work. I am also preparing for my webinar with Ed Tech Specialists, a organization working to assist educational reform in Michigan. I will be live on the web 10AM Eastern Time or 1500 UTC December 14, 2009. You will be required to register to attend. The webinar will be archived for later use. In the meantime, I have been thinking about the differences between arts and crafts, or more specifically, the difference between artistry and craftsmanship. Is it enough to have greater attention on artistry in schools, or is craftsmanship a necessary component through which to instill a sense of excellence? I would welcome your participation. When I was studying pottery at Memphis State University, my teacher gave me a B in one class because she said I was not doing enough to push the limits of my designs. I explained that I was trying to refine my designs and get develop greater skill in their production rather than spend my time making absurd products that might be of limited use. In a sense, I was responding to the material as a craftsman rather than an artist, seeking measurable growth of skill and design. Is there a difference in the level of rigor in either approach? It can be likened to the comparison between a shotgun and rifle. The latter requires a better aim. I am also reminded of a sculpture competition here in Eureka. The best of show according to a polling of guests was a monumental marble sculpture of an angel. The workmanship in the lifelike sculpture was flawless and the hours devoted almost beyond measure. It took a fork lift to carry it into the building. 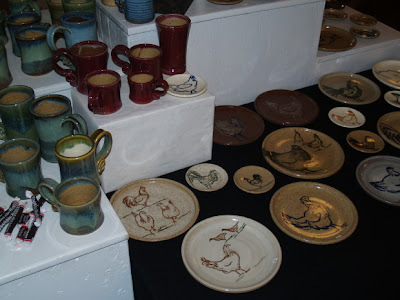 The piece that was awarded best of show by the judges and a cash prize was a free-form accident that occurred during a firing failure in a kiln. A shelf had collapsed, and pots had broken and fused into a mass of colors and shapes which the potter decided to call "sculpture." What happens when we look at "art" as being something conceived by accident rather than created by skill? What happens when we reward "artistry" with no consideration of "craftsmanship"? Will we then be led to the false conclusion that success in the arts or any other endeavor is due to natural aptitude rather than to work, practice, effort? Our children can learn lessons that affect their perception of values. Do they only then pursue the things that require the least effort? Or can craftsmanship, perhaps even more than the arts, impart a sense of the intrinsic rewards of rigor? The discoveries that take place in the arts and the discoveries that take place in science are from the same fabric. If we want students to become proficient in science, we must introduce them to the exploration of materials that takes place when they are challenged to create. Today we had long talks in the wood shop about listening. And the students suggested I can get their attention more effectively if I use a bell. So next week we will give it a test. We did get the wagons finished as you can see, and our van driver David was patient with our closing discussion and got included in the photo. Children need to take part in the solutions to work shop problems, and I am looking forward to the test. 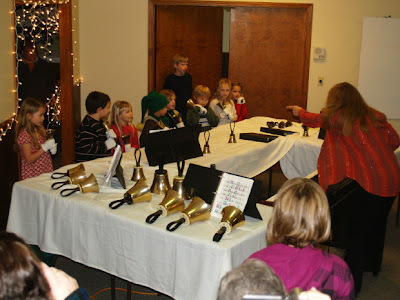 In fact, the bell is in my pocket and I'll test it with the first graders this afternoon as we make Christmas trees. An article from Greater Good Magazine describes the relationship between arts and the development of intellect. Arts and Smarts. And of course the conclusion is what you and I would expect. Howard Gardner describes the effort to justify the arts in terms of benefits to other studies as an "American disease." But I would disagree slightly. The American disease isn't our attempt to find rationale for the arts in what they contribute to other disciplines and areas of cognition. Our real sickness is our addiction to the distorted picture that standardized testing creates of human intelligence. That distorted view blinds us to the value of the arts. Yes, the arts do all those things that have been described. (Though of course some would inevitably disagree.) They make us better at math and science. They increase our interest in community and history. They improve cognitive skills in a variety of disciplines. Music does make us smart. And the point of the article is that the arts actually do much more. 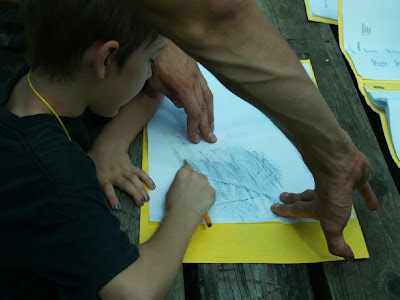 Drawing on two sources, Why Our Schools Need the Arts by Jessica Hoffmann Davis and Studio Thinking: The Real Benefits of Visual Arts Education by Hetland, Winner, Veenema and Sheridan, the article describes a number of these benefits. One of the vital skills that the arts teach is to "engage and persist." The arts "remind children that their emotions are worthy of respect and expression." In a day in which testable right and wrong answers dominate education, the arts teach us to work with ambiguity and to develop respect for other perspectives and judgments. And most importantly "the arts can engage children who might not otherwise be reached by academics." In other words, while most education is about what we know, and what we can cram in our short-term memories for regurgitation at test time, arts education defines who we are. The real measure of man is not in what he knows, but in what he does. Can we raise children to act with intelligence? We can look at a variety of issues that I have discussed in the blog. We are at a crisis in American education. And it particularly impacts young men through an epidemic of under-performance in academia. And so, what is the fix? Early advocates of manual arts training laid it all out for us. If only we could remember. 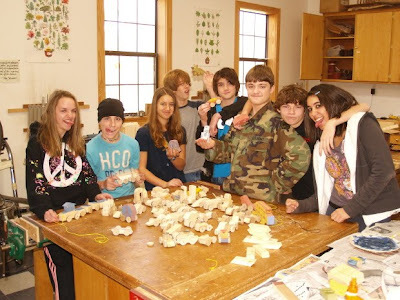 Today the 7th, 8th and 9th grade students worked on toys for our annual holiday toy making project. Even at those grades there is great satisfaction in seeing something develop in your own hands. And so, when it is finished there is the irresistible inclination to play. You want to see how it works, and then make another one, even better if you can. It was nice to be back in school today and the students were also pleased to be back at work. I spent the weekend reading in Charles A. Bennett's History of Manual and Industrial Education, 1870-1917, about the various arguments laid out by opponents of manual arts in schools. The schism seems to have been similar to what we see today. There are those who understand the value of the arts in school and those who do not. Some contend that the arts add value to every other facet of the curriculum, every other discipline. There are also those are those who demand, "prove it" and thence allow no evidence to interfere with their position. A third faction proclaims "Art for Art Sake!" Proclaiming that the value of the arts is unrelated to what the arts contribute to the intelligence and understanding in other disciplines and that to consider the needs of other disciplines when defining a rationale for the arts is demeaning of the arts. I agree completely with position one. What are the arts without science? And what is science without art? To see either narrowly defined and separate is to miss the point of each. And so I will repeat the old anthropologist's saying ..."In Bali they have no art. They do everything as well as they can." In our culture we have the term "arts" because we have a whole range of contrasting situations in which mindless creation and consumption are deemed acceptable.